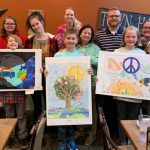 Students Lauren Philippi, Traci Green and Evan Immel attended the Peace Poster awards banquet at the Pizza Ranch on April 15th for their winning posters. The Indianola Lions Club sponsored this contest and presented a certificate and cash prize to the students as well as dinner for their families. A special guest, Janet Heinike (retired Art Programs Director at Simpson), was there to give students praise and insight on the importance of communicating through the language of art which is understood in all areas of the world. The artists presented how they communicated the theme "Kindness Matters" in their artwork. Indianola Info Hub Select your building to view announcements, information and more! Recent Instagram Photo - Bob Ross?